The dsp.ColoredNoise System object™ generates a colored noise signal with a power spectral density (PSD) of 1/|f|α over its entire frequency range. The inverse frequency power, α, can be any value in the interval [-2 2]. The type of colored noise the object generates depends on the Color you choose. When you set Color to 'custom', you can specify the power density of the noise through the InverseFrequencyPower property. The size and data type properties of the generated signal depend on SamplesPerFrame, NumChannels, and the OutputDataType properties. This object uses the default MATLAB® random stream, RandStream. Reset the default stream for repeatable simulations. Create the dsp.ColoredNoise object and set its properties. cn = dsp.ColoredNoise creates a colored noise object, cn, that outputs a noise signal one sample or frame at a time, with a 1/|f|α spectral characteristic over its entire frequency range. Typical values for α are α = 1 (pink noise) and α = 2 (brownian noise). cn = dsp.ColoredNoise(Name,Value) creates a colored noise object with each specified property set to the specified value. Enclose each property name in single quotes. cn = dsp.ColoredNoise(pow,samp,numChan,Name,Value) creates a colored noise object with the InverseFrequencyPower property set to pow, the SamplesPerFrame property set to samp, and the NumChannels property set to numChan. Noise color, specified as one of the following. Each color is associated with a specific inverse frequency power of the generated noise sequence. 'pink' –– The inverse frequency power, α equals 1. 'white' –– α = 0. 'brown' –– α = 2. Also known as red or Brownian noise. 'blue' –– α = -1. Also known as azure noise. 'purple' –– α = -2. Also known as violet noise. 'custom' –– For noise with a custom inverse frequency power, α equals the value of the InverseFrequencyPower property. InverseFrequencyPower, α can be any value in the interval [-2,2]. In a log-log plot of power as a function of frequency, processes generated by this object exhibit an approximate linear relationship with slope equal to –α. This property applies only when you set Color to 'custom'. Number of samples per output channel, specified as a positive integer. This property determines the number of rows of the signal. Number of output channels, specified as an integer. This property determines the number of columns of the signal. 'Global stream' –– The current global random number stream is used for normally distributed random number generation. 'mt19937ar with seed' –– The mt19937ar algorithm is used for normally distributed random number generation. The reset function reinitializes the random number stream to the value of the Seed property. Initial seed of mt19937ar random number stream generator algorithm, specified as a nonnegative integer. The reset function reinitializes the random number stream to the value of the Seed property. Output data type, specified as either 'double' or 'single'. noiseOut = cn() outputs one sample or one frame of colored noise data. Colored noise output, returned as a vector or matrix. The SamplesPerFrame, NumChannels, and the OutputDataType properties specify the size and data type of the output. The output from this example shows that pink noise has approximately equal power in octave bands. Generate a single-channel signal of pink noise that is 44,100 samples in length. Set the random number generator to the default settings for reproducible results. Set the sampling frequency to 44.1 kHz. Measure the power in octave bands beginning with 100-200 Hz and ending with 6.400-12.8 kHz. Display the results in a table. 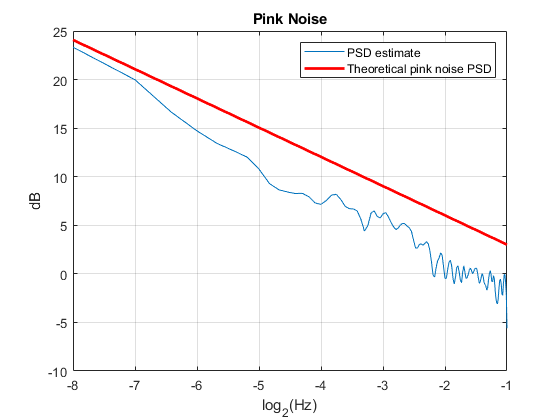 The pink noise has roughly equal power in octave bands. Rerun the preceding code with 'InverseFrequencyPower' equal to 0, which generates a white noise signal. A white noise signal has a flat power spectral density, or equal power per unit frequency. Set the random number generator to the default settings for reproducible results. Set the sampling frequency is 44.1 kHz. Measure the power in octave bands beginning with 100-200 Hz and ending with 6.400-12.8 kHz. Display the results in a table. White noise has approximately equal power per unit frequency, so octave bands have an unequal distribution of power. Because the width of an octave band increases with increasing frequency, the power per octave band increases for white noise. Generate a pink noise signal 2048 samples in length. The sampling frequency is 1 Hz. Obtain an estimate of the power spectral density using Welch's overlapped segment averaging. Construct the theoretical PSD of the pink noise process. 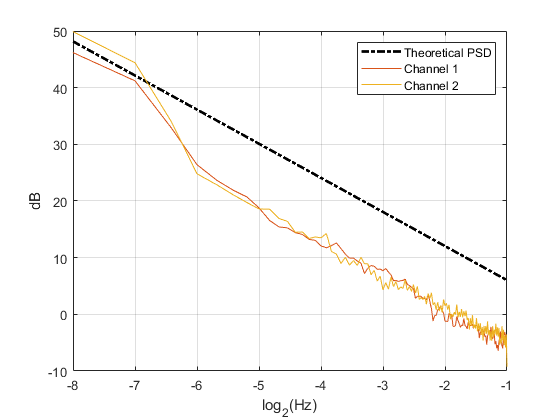 Display the Welch PSD estimate of the noise along with the theoretical PSD on a log-log plot. Plot the frequency axis with a base-2 logarithmic scale to clearly show the octaves. Plot the PSD estimate in dB, 10log10. Generate two channels of Brownian noise by setting Color to 'brown' and NumChannels to 2. The sampling frequency is 1 Hz. Obtain Welch PSD estimates for both channels. The fourth argument of pwelch, NFFT, which is the number of FFT points, is empty. Hence, NFFT is set to 256. For even NFFT, The number of FFT points used to calculate the PSD estimate is (NFFT/2+1), which equals 129. Construct the theoretical PSD of a Brownian process. Plot the theoretical PSD along with both realizations on a log-log plot. 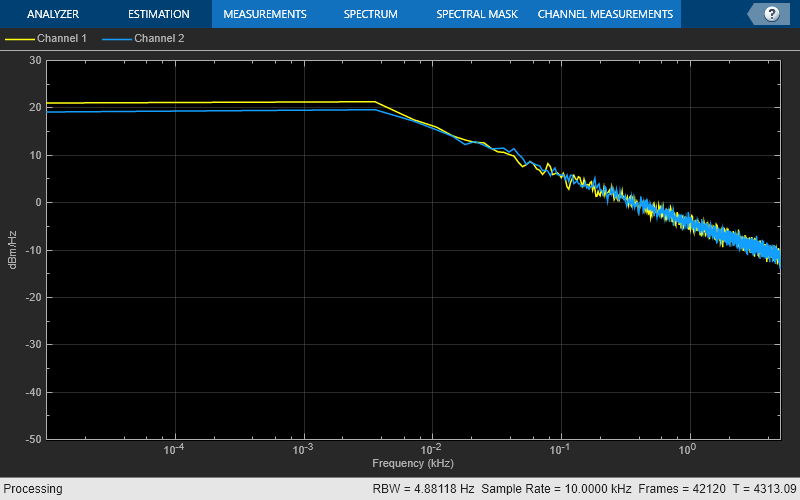 Use a base-2 logarithmic scale for the frequency axis and plot the power spectral densities in dB. This example shows how to stream in an audio file and add pink noise at a 0 dB signal-to-noise ratio (SNR). The example reads in frames of an audio file 1024 samples in length, measures the root mean square (RMS) value of the audio frame, and adds pink noise with the same RMS value as the audio frame. Set up the System objects. Set 'SamplesPerFrame' for both the file reader and the colored noise generator to 1024 samples. Set Color to 'pink' to generate pink noise with a 1/|f| power spectral density. Stream the audio file in 1024 samples at a time. Measure the signal RMS value for each frame, generate a frame of pink noise equal in length, and scale the RMS value of the pink noise to match the signal. Add the scaled noise to the signal and play the output. 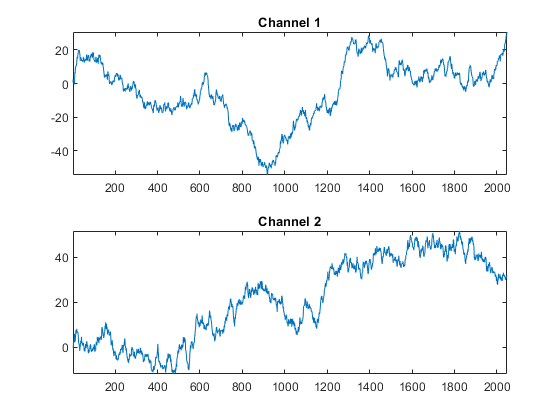 Generate two-channels of pink noise and compute the power spectrum based on a running average of 50 PSD estimates. Set up the colored noise generator to generate two-channels of pink noise with 1024 samples. Set up the spectrum analyzer to compute modified periodograms using a Hamming window and 50% overlap. Obtain a running average of the PSD using 50 spectral averages. Run the simulation for 30 seconds. If α > 0, S(f) goes to infinity as the frequency, f, approaches 0. Stochastic processes with PSDs of this form exhibit long memory. Long-memory processes have autocorrelations that persist for a long time as opposed to decaying exponentially like many common time-series models. If α<0, the process is antipersistent and exhibits negative correlation between increments . α = 0 — White noise, where L(f) is a constant proportional to the process variance. α = 1 — Pink, or flicker noise. Pink noise has equal energy per octave. See Measure Pink Noise Power in Octave Bands for a demonstration. The power spectral density of pink noise decreases 3 dB per octave. α = 2 — brown noise, or Brownian motion. Brownian motion is a nonstationary process with stationary increments. You can think of Brownian motion as the integral of a white noise process. Even though Brownian motion is nonstationary, you can still define a generalized power spectrum, which behaves like 1|f|2. Accordingly, power in a brown noise decreases 6 dB per octave. α = -1 — blue noise. The power spectral density of blue noise increases 3 dB per octave. α = -2 — violet, or purple noise. The power spectral density of violet noise increases 6 dB per octave. You can think of violet noise as the derivative of white noise process. where a0 = 1 and w(n) is a zero-mean white noise process. The AR method used in dsp.ColoredNoise is detailed on pp. 820–822 in . Beran, J., Y.Feng, S.Ghosh, and R.Kulik, Long-Memory Processes: Probabilistic Properties and Statistical Methods. NewYork:Springer, 2013. Kasdin, N.J. "Discrete Simulation of Colored Noise and Stochastic Processes and 1/fα Power Law Noise Generation." Proceedings of the IEEE®, Vol. 83, No. 5, 1995, pp. 802-827.